BANGKOK: Thai authorities have come out to defend China’s treatment of the 85 men and 24 women Uighur migrants it deported to that country after official Chinese government video was broadcast showing Uighurs seated on a plane with black hoods over their heads and flanked by police. 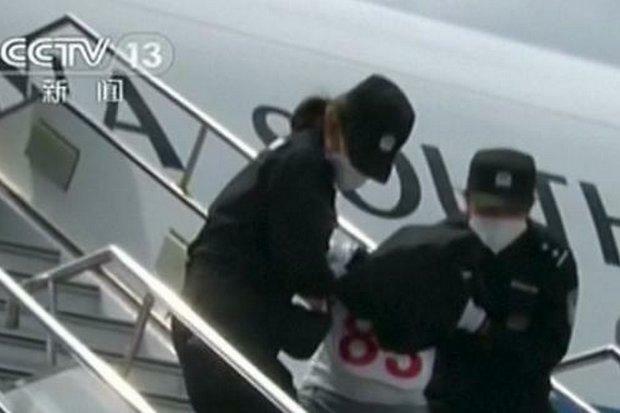 China's state TV shows armed police manhandling a Uighur man down the steps of the China Southern Airlines charter from Songkhla. The Uighurs, each accompanied by a guard, were those handed over to China by the government last week after secret negotiations that brought worldwide criticism. According to video and commentary on the state television broadcaster CCTV, the 109 Uighurs sent from Songkhla, and who ended up on the rendition flight to an unknown destination in China, were mainly from the country’s western Xinjiang region and were attempting to enter Turkey and join the jihad in Syria and Iraq. Thirteen of them were also terror suspects. No confirmation was available on where the video was taken or where the Uighurs ended up. Deputy government spokesman, Maj Gen Weerachon Sukhondhapatipak, said on Sunday (July 12) that the Chinese authorities “deserved to be understood” for the way they handled the migrants on the plane. Chinese authorities needed to enforce strict security measures to prevent any resistance or attempts to hijack the aircraft, Maj Gen Weerachon said. “It is part of the Chinese authority's security measures,” he said, adding that Beijing has assured Thailand it will ensure justice for migrants suspected of breaking the law when they arrive back to face trials. Thailand has been criticised by the UN, the European Union and human rights groups for repatriating the 109 Uighurs back to China, where activists say they face persecution. All of the Uighur migrants held by the government should have been sent to Turkey, which has accepted Uighurs in the past. While human rights activists have condemned the Chinese authorities’ treatment of the migrants, Beijing has said it is ready to welcome observers from Thailand and international organisations to witness the trials. Angkhana Neelapaijit, chairwoman of the Working Group for Peace and Justice, slammed Chinese authorities for the degrading treatment of the deported migrants on the plane. “It is an inhumane and cruel act to deport the migrants with hoods over their heads,” Ms Angkhana said. The treatment is the opposite of the assurance given by Prime Minister Gen Prayut Chan-o-cha that the Chinese authorities would treat the deported Uighurs migrants well, she said. Even though Thailand is a signatory to the Convention against Torture and Other Cruel, Inhuman or Degrading Treatment or Punishments, the government failed to comply to it with its deportation of the Uighurs to China, Ms Angkhana said. “Uighurs accused of committing offences are still considered innocent until proved guilty in court, and they should deserve better treatment and their human dignity should be respected,” she said. Thailand’s decision to send more than 100 Uighurs to China last week also sparked outrage in Turkey. A nationalist group attacked and trashed the Thai honorary consul’s office in Istanbul. A total of 180 ethnic Uighur refugees out of a group of more than 350 held in Thailand since early this year have now been sent to Turkey, and 109 deported to China. The group sent to Turkey comprises 144 children and 36 women, and to China, 85 men and 24 women. A further 52 remain in Thailand while their nationalities are being verified. Prime Minister Prayut is to chair a meeting Monday of the National Security Council, during which a final decision is expected on whether Thai authorities will be sent to China to monitor the condition of the Uighurs. Maj Gen Sansern Kaewkamnerd, another deputy government spokesman, said the government has taken the best course of action to deal with the Uighur migrants. The migrants entered the country illegally and there is evidence some of them committed transgressions in their country of origin. Once their nationality was verified, the government had no choice but to send them back, Maj Gen Sansern said. Migrants who are not guilty of any wrongdoing will be sent to a country of their choice once their nationality is checked, he said. Thailand was right to do this, or did the human rights want to wait until they killed someone. Prevention is a much better way.